So it was finally time, and I must admit that excitement was starting to get the better of me. So hold onto to your hats as there are lots of photo’s and links for you. After my scans and blood tests on the 18th April it was time for me to get my act together, write a list and start my packing to go on retreat to practice yoga in Tuscany. Thankfully after having my MRI and CT scans on the same day again I did not have the issues I had last time, although I was up in the early hours of the following morning with bad bloating and cramps it passed quickly with the application of morphine, and I wasn’t off my feet for a couple days like last time. I put down to the fact that there was a longer gap between the scans and their separate contrasts. However, I was very tired on the Thursday so made sure I did nothing to aggravate things as I was determined that I would be as good as I could be for the holiday. Also it was Hubby’s birthday on the Friday and I didn’t want to put a dampener on that either. On his birthday morning I presented him with a new fitness tracker, he had had my old one from Christmas, and after saying he would only probably wear it for 24 hours to keep me happy, inevitably had found himself hooked too. So it was time for something a bit fancier, that he could also use when cycling, something that would allow his analytical brain to get greater detail. Basically more functionality and better graphs, oh and medals! We also went out for a nice meal that night too, however my present was never going to top his present to himself, and Audi TT Quattro sports line. To be fair he has been saving and looking for a new car for the last 4 years, and it was a great relief that he had finally made a decision. The only downside is that it is not dog friendly, so we will be keeping his old car for now to, so as Buddy boy can still go to his favourite muddy walking places preferably with a stream thrown in, and boy does he love his mud and water!! By Saturday night most of the packing was done, and on Sunday I had my jab 3 days early to save taking it with me. As a results of bringing it forward I have now decided to keep it to a Monday, in the hope that my post jab lag will no longer impact on weekends. In hindsight I should probably have done it ages ago. Then it was time for an early night as taxi pick up was at 05:30, Shelle stopped over and Amanda drove over in the early hours. We arrived at the airport in plenty of time, where I topped up my painkillers and obtained my invisible illness pass from the customer services desk before checking in. What a godsend that was, our luggage was checked-in straight away and we were fast-tracked through security, having had my jab the night before I was worried about getting caught short whilst in the queue, so it definitely relieved the stress. When we landed in Pisa we met up with the rest of the retreaters and our Yoga teachers Sarah and Lorenzo, made our introductions and met our extra passenger Vic. Everybody picked up their hire cars, and then we had us a convoy (10/4!!) 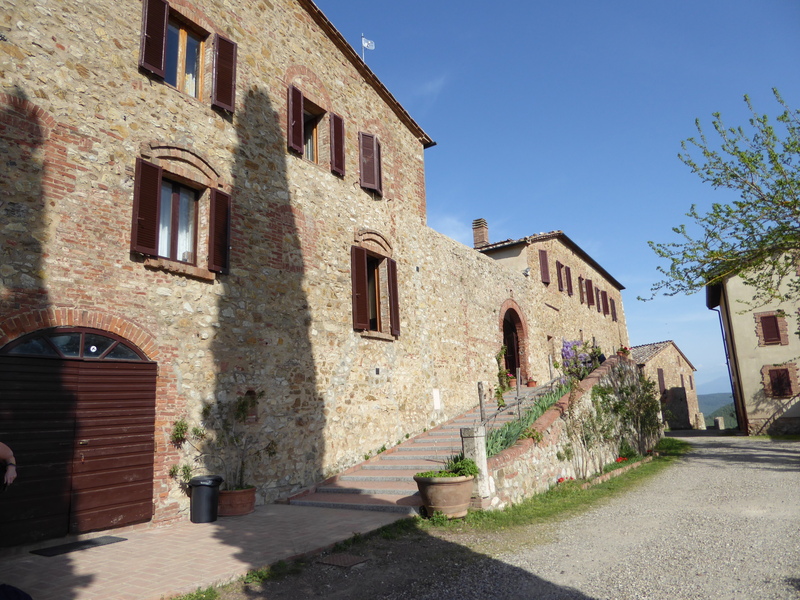 all the way to our farmhouse retreat in Monticiano, which is part of the Siena region. The drive took just over 2 ½ hours with a quick stop for lunch, the sun was out the sky was blue it was lovely and warm and the scenery was stunning, a complete contrast to the grey skies, wind and rain we had left behind in Stoke. 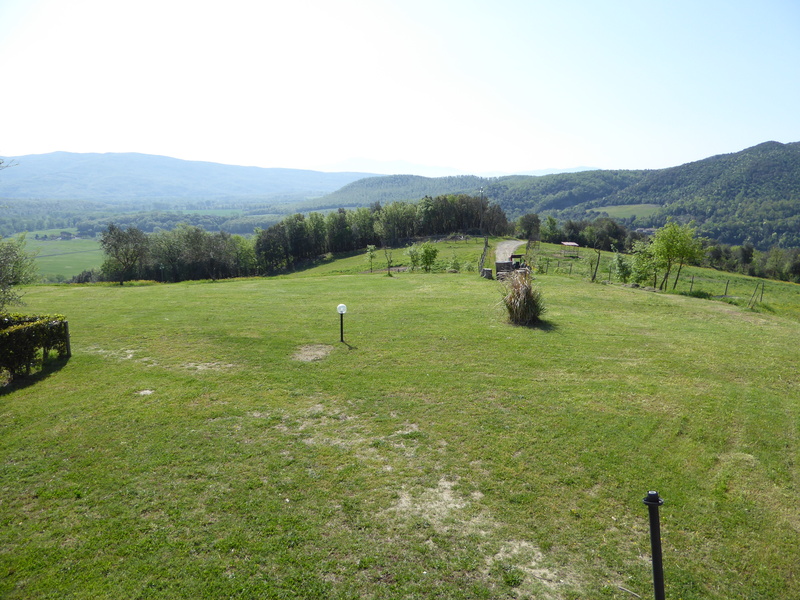 The pictures of Tuscany do not lie, it was everything I had expected it to be, as we drove past towns, villa’s and farms built into the hillsides.I have been to Italy a couple of times before, but not into the heart of Tuscany. Following our yoga it was time to eat, some of last years attendees had warned us about the blandness of the food when we had stopped for a late lunch, we thought they were exaggerating, surely we would be getting good quality rustic Italian food, it was definitely rustic. To be fair as far as I was concerned I did better than I expected being gluten free, although I think it will be a while before I have a pasta meal again. 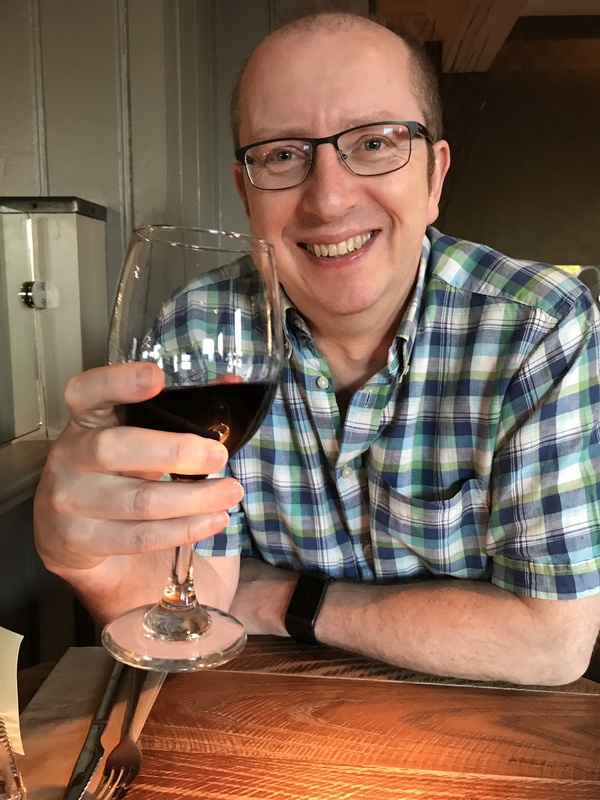 Although initially I think they thought that as I was gluten free I was also vegetarian, and it was a good few days before I saw any meat in my meals at the villa. Once again though, we couldn’t fault the view, and I definitely think that the food helped the group to get to know everybody, a common bond. There wasn’t a night where we sat around the meal table and didn’t have a good laugh. I didn’t make the first yoga morning practice as I was shattered and post jab lag was starting to set in, but I did make breakfast and following that we all packed our swimming gear and sun hats and headed to the vineyard down road to unwind after the previous days travelling beside their pool and enjoy a late lazy lunch. 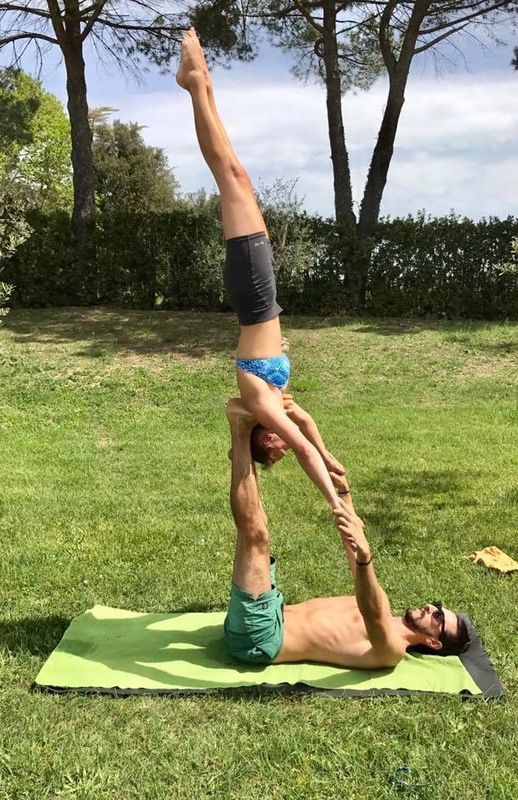 We also watch in awe as Sarah and Lorenzo practiced acroyoga together with Mike and Sarah, and as it turned out Mike was also a yoga teacher and would be helping with some of the sessions during the week. I made morning yoga on the Wednesday, then following breakfast we made out way into Montalcino, a lovely old mediaeval town with a castle, lots if little side streets to investigate and a lovely place for lunch. The ice cream was rather good to! We also visited another vineyard on the way back, Castello Banfi which had a loo with a great view. Needless to say a few purchases were made before we returned to the farm for evening practice and meal, which I think was the only evening meal we had there that didn’t contain pasta in some form. Thursday morning though I was fit for nothing, I had had a painful and restless night and come to the conclusion that 2 yoga sessions in one day was beyond my capabilities. Morphine was definitely my best friend that day, it enabled me to visit the hot sulpher springs in the morning, which once we got used to the smell were very relaxing. It was like having a nice warm bath in the ☀ I did attend the afternoon workshop but didn’t really participate, I just watched, relaxed in the sun and took pictures. I also started my second book of the holiday “The Tuscan Shepherdess”by Lynda Lafferty, I thought it would be an appropriate holiday read. As it turned out it was an excellent read, loosely based on a lady called Virginia Tacci who was the first woman to ride in the Palio in 1581 at 14 years of age. The Palio is the annual horse race around the main square in Siena, and only one other woman has ridden in it since, Rosanna Bonelli in 1957. As it turned out on the Friday we had a day in Siena, what a beautiful old town, we had lunch in the square where the Palio is held, made a couple of purchases and ate more ice cream. It was exciting to see places that I was reading about, and pass signs for towns that were also mentioned in the book, it helped to bring it to life. Saturday saw the 2nd workshop of the retreat, this time on the acroyoga that Sarah and Lorenzo had been practicing earlier in the week, after trying a couple of moves I knew it wasn’t for me or should I say my stomach, so out came the camera again. Martin also helped out with this session, as he also teaches yoga. I was really sorry I couldn’t participate, but it was amazing to see everybody achieve what they did, there was a lot of bravery and trust involved. Following this we had evening practice, and then it was party time. That evening the whole group went into the small local town of Pari Pari, where we had an excellent meal at the restaurant Trattoria da Rosanna in the square which included lots of wine and dancing. Luckily nothing was planned for Sunday other than morning and evening practice, with some mediation and chanting in the little on-site chapel in the afternoon for those who fancied it. So most of us spent the morning lounging by the pool, and a few of us did the meditation and chanting in the chapel, which felt very spiritual, the chapel definitely had a very soothing feel to it. 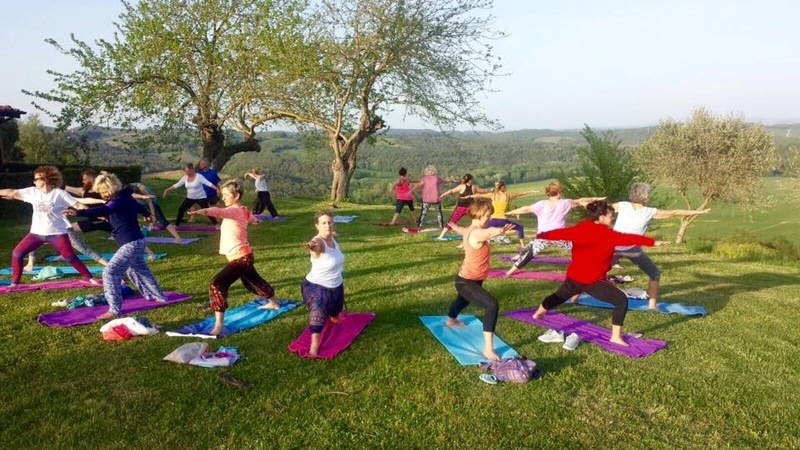 If you are local to me and fancy trying some yoga classes run and attended by the Tuscan retreaters here are the links for Shelle’s Blue Moon Yogaclasses, Sarah’s Jakaranda Yogaclasses, and Martin’s Hatha Yogaclasses. Needless to say, the first thing I did when we got home was have a proper cup of tea which was accompanied by a fish finger sandwich (it was as near as I was going to get to any meat based food on Monday night!! ), and even though I am not a big bread eater I had not seen any for a week. Tuesday I was pretty much wiped out but very chilled and relaxed, so apart from washing the holiday clothes most of the daywas spent on the settee. I would thoroughly recommend trying something like this if you are in the position to do so! Then before I knew it, it was Wednesday and time to head back up to the Christie for my results. This is always an anxious day, although to be fair I have been lucky so far. In a nutshell, there has been a slight increase in size to a couple of my uninvited aliens in the liver, but nothing that requires any change in my treatment and everything else appears to be stable. However, just to be sure my scans are going to the next MDT (Medical Disciplinary Team)meeting this month to see if any further treatment is recommended. I should know about that in the next few weeks. After I had given my updates it was also decided to send me for a bone scan due to the persistent pain in my right hip which isn’t helped by yoga or my regular osteopath visits; just to be on the safe side. So last Thursday my daughter Judith accompanied me for a change, it was a long day. After being injected with the radioactive tracer we had three hours to kill before I was ready for scanning, so I finally had time to make a visit to the Maggie’s centre across the road from the Christie making sure I kept everybody at arms length as best I could.What a lovely space, very calm and welcoming, lots of open space a lovely garden and a big wood burner suspended from the building. Next time I have time to kill whilst I am at the Christie I will definitely be heading over there. What was even better is that I got my got my results the next day, Friday, my bones are clear, which is a massive relief. So now I just need to take myself back to the GP and get the arthritis in my lower back re-checked, to see if that is the cause. Once again, fingers crossed!